Kabaddi is a lively game ~ much loved in Tamil Nadu – as in many parts of the Nation. The 6th Season of Pro-kabaddi got off to a great start today. This is 6th Season of the tournament. The defending champions are Patna Pirates, who had defeated the Gujarat Fortune Giants in the 2017 Pro Kabaddi League Final. Earlier, a total number of 181 players were bought by 12 franchises in the Pro Kabaddi League auction held in Mumbai on 30 and 31 May. And after two days of non-stop action, a total of Rs 45.93 crore was spent by the teams, who at the start of the auction had a budget of Rs 4 crore each. For the time in PKL history, players were bid for over Rs 1 crore. As many as six players – including 5 Indians and 1 Iranian – were were bagged for over a crore. Monu Goyat became the highest payed non-cricket sportsman in Kabaddi history. Among the foreign players, it was Fazel Atrachali who had the highest pay day after netting a whopping Rs 1 crore sum. Other Star Marquee Players like Rahul Chaudhari who was retained by Telugu Titans via FBM for Rs 1.29 crore, Deepak Niwas Hooda who was bought by Jaipur Pink Panthers for Rs 1.15 crore and Nitin Tomar who was bought by Puneri Paltans for Rs 1.15 crore were critical acquisitions in the auction. There are 12 teams : Bengal Warriors, Bengaluru Bulls, Dabang Delhi KC, Jaipur Pink Panthers, Patna Pirates, Puneri Paltan, Telegu titans, U Mumba, Gujarat fortune Giants, UP Yoddha, Tamil thalaivas & Haryana Steelers. 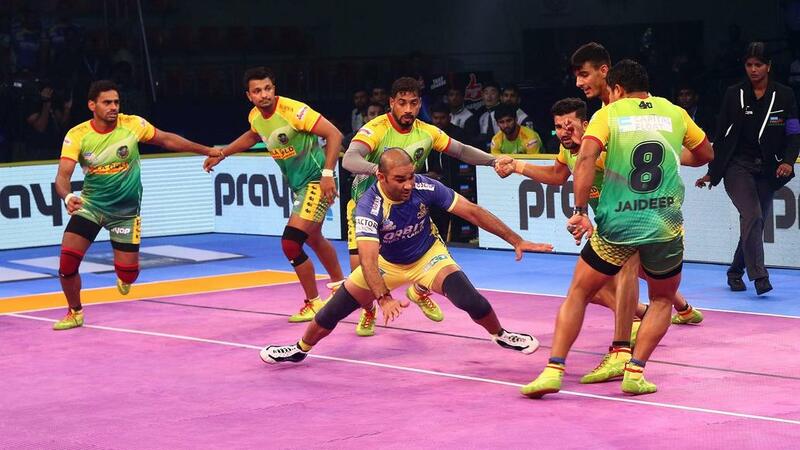 Pro Kabaddi Season 6 got off to a superb start as Tamil Thalaivas displayed aggressive kabaddi in the opening game to take out defending champions Patna Pirates 42-26 at the Jawaharlal Nehru Indoor Stadium in Chennai tonight. For the uninformed, in this league of Kabaddi, each team must have a minimum of 10 (ten) Players and a maximum of 12 (twelve) Players in its match-day playing squad. 7 (seven) Players shall take the ground at a time and the remaining 3 (three) to 5 (five) Players shall be substitutes. Each team is mandatorily required to have 1 (one) overseas Player in their match-day playing squad. The duration of the match shall be a minimum of 40 minutes divided equally in two halves of 20 minutes each along with 5 minutes interval between halves. The teams will change sides after the interval. The number of players for each team at the start of second half shall remain the same as it was at the end of first half. Each team shall score one point for every opponent out or put out. The side, which scores an ALL-OUT, shall score two extra points. The out and revival rule will be applicable. From its inception in 2014, The League has revolutionised the sport of kabaddi with stunning innovations, making it an aspirational sport for players and fans alike. The addition of four new teams in the fifth edition of the league made VIVO Pro Kabaddi India’s biggest sports league in terms of geographical representation and number of teams. The new sides – Gujarat Fortunegiants, Haryana Steelers, Tamil Thalaivas and U.P. Yoddha made the competition all the more intense and the kabaddi all the more exciting. Tonight at Chennai, Captain Ajay Thakur scored an impressive 14 points to lead Tamil thalaivas to their first victory at home while Amit Hooda kept opposition captain Pardeep Narwal from running away with the game and scored 4 tackle points in the process. The game started firmly in favour of the Thalaivas with Ajay Thakur’s pace and Amit Hooda’s confidence in defence giving the team their first All-Out over the Pirates and an 11-2 lead. Patna’s defence were unable to keep up with Thakur’s constant assault but their captain Pardeep Narwal kept them in the hunt by taking out Manjeet Chhillar and Ajay Thakur in one raid before sending back Jasvir Singh to reduce the Thalaivas to four players. Having survived the scare, Tamil Thalaivas went on the offence once again and brought about a Patna All-Out once again in the 16th minute to take 23-8 lead. Manjeet Chhillar, who had been troubled by Narwal in the earlier part of the half, came back into the game with 3 tackle points. The first half ended with the Thalaivas having a big advantage with a 26-8 lead. The second half had more of the same from Tamil Thalaivas. Pardeep Narwal and young Manjeet from Patna Pirates were the only players giving a fight but received little support from the defence.